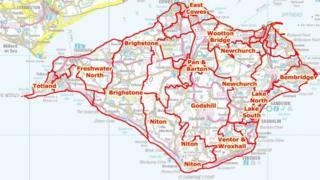 The Isle of Wight could lose one councillor under recommendations by the boundary commission. Draft recommendations propose 39 councillors for the island - one less than than the 40 currently elected. The plans would also mean changes to all but five of the island's existing divisions. A 10-week public consultation on the recommendations started on Tuesday and runs until 12 November. Cowes Medina, Cowes South and Northwood, East Cowes, Wootton Bridge, and Nettlestone and Seaview divisions would remain as they are under the proposals. The other existing divisions would be scrapped and in some cases wards renamed. One of the 38 wards would have two councillors. Copies of the Local Government Boundary Commission's report and maps are available to view at council buildings as well as online. Colin Mellors, chair of the commission, said: "Our review aims to deliver electoral equality for local voters. "This means that each councillor represents a similar number of people, so that everyone's vote in council elections is worth roughly the same, regardless of where you live. "We also want to ensure that our proposals reflect the interests and identities of local communities across Isle of Wight and that the pattern of divisions can help the council deliver effective local government for local people."